From the depths of the Antares Star System, on a scorched planet of soot and ash, a modified mutant emerges -- Creepy. Through a weird intermingling of metallic and living parts, this fearsome creature rises -- easily able to change from monster-robot to monster-vehicle. 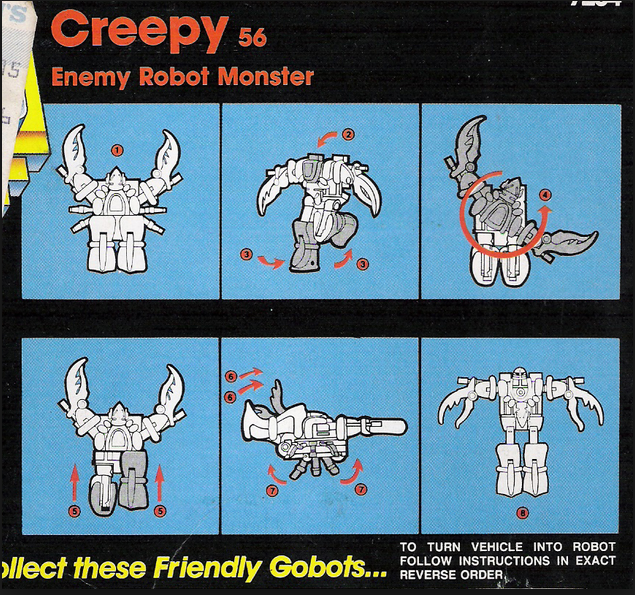 A welcome recruit to Cy-Kill's band of Renegades, Creepy can use his claws to snap GoBots in half, or send a lethal poison shooting out from his spider legs. The worst of all monsters to creep into existance, Creepy thrills to the sport of his deadly games. Even Renegades must take care that Creepy's power doesn't threaten their existence. Guardians -- Beware! The final conflict may be near!